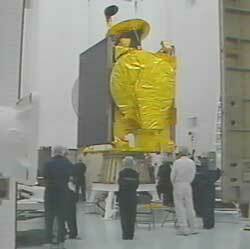 Weighing in at more than 3 tonnes, W4 will be launched out of Cape Canaveral by a Lockheed Martin Atlas 3A vehicle. Eutelsat's 31-transponder Ku-band satellite, delivered by Alcatel Space, will be positioned at 36 degrees East where it is scheduled to go into service in June. W4 is an important addition to EUTELSAT's extensive satellite system, and carries two specific missions. A total of 19 transponders on the satellite will be switched into a high-power fixed beam over Russia. Sixteen of these transponders, corresponding to the frequencies held by the Russian Federation (the RST-1 / RITM network), will be used for direct-to-home digital television broadcasting by the Russian media group Media Most. One fixed and one steerable beam, each with six transponders, will be pointed over sub-Saharan Africa where they will be used for a range of services; most particularly digital pay television and broadband Internet access for a major African client. W4 will be copositioned at 36 degrees East with EUTELSAT's SESAT satellite that was successfully launched on April 17 by a Proton launcher out of the Baikonur Cosmodrome. SESAT's 18 Ku-band transponders are scheduled to go into service next month for a range of business-to-business services that include Internet backbone connections, corporate networks and the EUTELTRACS mobile messaging and positioning service. It will provide coverage of Europe, North Africa, the Middle East and the Indian sub-continent. With the entry into service of SESAT and W4, EUTELSAT's resource will consist of 16 Ku-band satellites spanning the orbital arc from 12.5 degrees West to 48 degrees East and with visibility of Europe, Africa, large parts of Asia and connectivity with North and South America. The launch of W4 will be broadcast live in digital in-the-clear by HOT BIRD 3 at 13 degrees East (downlink frequency 12.111 GHz; vertical polarization; FEC 3/4, symbol rate 27.5 symbol). Launch site: SLC-36B, Cape Canaveral, Fla. Launch preview - Read our story for a complete preview of the first Atlas 3A launch. Atlas 3A vehicle data - Overview of the rocket that will launch W4 into space. The RD-180 - Facts and figures about the Russian-built engine to power Atlas 3. Launch windows - Available windows for future launch dates of AC-201.